If the thought of a data breach is keeping you up at night, this presentation will give you tangible recommendations on strengthening your information security strategy. Based on the Trustwave 2012 Global Security Report, the presentation will feature data from more than 300 investigations and 2,000 penetration tests conducted in the previous 12 months. - What are the 3-5 top cyber threats CISOs are worried about in 2018? What's new on the threatscape? - How to improve cybersecurity? Key areas to focus on. Top recommendations for CISOs. - Data breaches affecting millions of users are on the rise. What are the security controls / policy changes / tech solutions businesses should implement to prevent breaches and detect them faster? - What are the biggest threats to security coming from the IoT? Are you worried about cyberwarfare? How should we be protecting our critical infrastructure? - Cybercrime is on the rise. How can businesses defend against ransomware, phishing, social engineering, and other cyber-attacks? Is investing in technology enough, or should the focus also be on cyber awareness education for employees. - There is chronic shortage of skilled cyber security workforce in the US and worldwide. How are businesses coping with the lack of cyber talent in the age of cyber-attacks? Is AI/ML helping alleviate the problem? How does diversity (or lack thereof) play into all of this? - What career path will be most advantageous to people starting their cybersecurity career? - Can you explain testing maturity models as it relates to test organizations conduct to test their security posture? - How do you properly scope testing? - How do you test in cloud and hybrid environments? - Can you explain the compliance vs security mindset? Cybercriminals are setting their sights on hospitality businesses across the U.S. and Europe with unprecedented malware attacks known as Carbanak, as part of precise and difficult-to-stop APT-style operation that we code-named 'Grand Mars'. Our Trustwave SpiderLabs team of incident responders and researchers have spent months analyzing Grand Mars and its elements, and unlocking strategies that can be used to identify and mitigate this insidious campaign – which may soon spread to e-commerce and retail organizations as well. Your organization has its own unique IT infrastructure, business model, risk profile and tolerance. The best strategy for streamlining your annual Payment Card Industry (PCI) validation process is to make sure that your Qualified Security Assessor Company (QSA-C) employs a sound and forward-looking methodology for your assessments. A key first step is understanding the critical differences between risk acceptance and risk mitigation and the implications for your business. -The impact on PCI assessments, including PCI Data Security Standard (DSS), Payment Applications DSS and P2PE (Point to Point Encryption). -How sound methodology helps you build a better foundation for security and compliance - whatever your starting point. -Top considerations for evaluating methodology. Ransomware and CEO email fraud cause organizations billions of dollars in losses annually. These next level threats are so lucrative that they are accelerating hacking innovations and exploding attack frequencies. Ransomware damages user productivity, creates emergency work for IT and at least one CEO has been fired because of CEO email fraud. Security solutions and users have to be smarter than ever before. • What these attacks look like to your users. • The essentials and limitations of user training. • Which automated techniques are most effective at stopping unknown attacks. Join Alexander Norell, Director of Global Risk and Compliance Services at Trustwave, as he shares his insider view of what you can expect at the upcoming 2016 Payment Card Industry Security Standards Council (PCI SSC) Europe Community Meeting in October. Alexander’s findings will be based on what he learns from his attendance at the North America Community Meeting and his insight as a subject matter expert on PCI compliance. One in five businesses don’t test for security vulnerabilities. A recent study by Osterman Research found that many businesses fail to conduct frequent security testing despite believing that it’s critically important to securing their systems and data. •Common types of security issues experienced in the past 12 months. •The extent to which organizations take a proactive approach to security testing. •Types of security testing conducted during the past 6 months. •How often organizations conduct detailed review of security tests. •Challenges faced by organizations in the context of security testing. La versión 3.2 del PCI DSS (Payment Card Industry Data Security Standard) ha sido anunciada - las organizaciones que deben cumplir precisan entender los cambios y sus implicaciones. Participe de nuestro webinar para entender más sobre por qué fue lanzado tan rápido y cómo puedes parar mejor a tu organización. • ¿Qué significa para su negocio? • ¿Por qué deberías implementar los cambios, aunque no sean mandatorios? • ¿Qué puede venir en el futuro próximo? Trustwave offers advice for those looking to take back control of their cyber destinies. Cybercrime has become a world-wide epidemic as organized crime syndicates are literally making money hand over fist in extorting businesses or otherwise stealing valuable data and company assets. Combined with a global shortage of trained security professionals and you literally have "The Perfect Storm" of cybercriminal activity. -Understand who is targeting you. -Get a handle on just how they are doing it. -Learn some key tactics and solutions to combat today’s modern cybercriminal. A versão 3.2 do PCI DSS (Payment Card Industry Data Security Standard) já foi anunciada – as organizações precisam entender as mudanças e suas implicações. Participe para aprender mais sobre o porquê foi lançado tão rápido e como você pode preparar a sua organização. • Que significa para o seu negócio? • Porque você deveria implementar essas mudanças, mesmo que não forem mandatórías? • O que pode vir no futuro próximo? More malware today is machine-generated and one-off. With advanced malware also employing obfuscation and anti-sandboxing techniques, just how "secure" are secure web gateways? The reality is - many are just not that secure anymore. Based on 2015 breach investigations, Trustwave found that 42% of malware used encryption, underscoring the importance of having an advanced secure web gateway with the capability to inspect encrypted content. -Ensure real-time blocking of encrypted new malware. -Virtually patch web browsers, and more. Las presiones de seguridad continúan aumentando – hoy más que nunca. Sabemos que probablemente usted esté bajo estrés, no satisfecho, y bajo ataques. Trustwave encuesto a 1.414 profesionales de seguridad informática para entender los factores emocionales que contribuyen a sus dolores de cabeza y desafíos. Súmate a aprender como aliviar esos puntos de dolor y escaparle a la presión. • ¿Los profesionales de seguridad sienten que tienen suficientes habilidades y personal? • ¿Cómo han cambiado año a año las presiones de seguridad en general? • ¿Cuáles son algunas recomendaciones prácticas que puedes implementar en tu organización para reducir la presión? Web application security differs significantly from other information security disciplines. In addition to encompassing other security disciplines such as encryption, authentication, network and operating system security, it requires specialized knowledge of web applications and coding techniques. Due to its abstract and multifaceted nature, it understandably may elude the grasp of executive management (“but we have a firewall . . .”) and, as a result, find itself at the bottom of the security budget totem pole. •The current state of web application security and its relationship to enterprise security. •Why web application security is more complex than other security disciplines. •The tasks that need to be performed in application security. •The different methods of web application testing and mitigation. •Available implementation options based on the in-house resource and budget constraints. We will conclude the session with a discussion of a web application security methodology that will utilize the specialized skills of different members of your IT organization. Payment Card Industry Data Security Standard (PCI DSS) 3.2 has now been announced - organizations who must comply need to understand the implications. Join us to learn more about the drivers for the early release of the mandate and how you can best prepare your organization. -What the updates mean for your business? -Why you would want to make these changes even if they weren’t mandated? -What may be on the horizon? The 2016 Trustwave Global Security Report has just been released. The report offers a glimpse into the secret world of cybercrime organizations and details methods used to maximize profits from malicious attacks. The report also highlights how adaptable, creative and relentless cybercriminals are when it comes to getting access to the information they want. • Learn how cybercriminals changed tactics in 2015 and started targeting a greater variety of data. • Hear an in-depth analysis of the top cybercrime, data breach and security threat trends from 2015. • Get key insights on how to best defend your business assets amidst the evolving threat landscape and varying tactics of cybercriminals. Security pressures are mounting - and there are more of them than ever before. We know you're under stress, understaffed, and likely, already under attack. Trustwave surveyed 1,414 information security professionals to understand the emotional factors that contribute to a security professional’s headaches and hardships. Join us to learn how to alleviate these pain points and escape the pressure. • Do security pros feel they have enough skills and personnel? • How have overall security pressures changed year over year? • What are some practical recommendations you can implement in your organization to reduce the pressure? It is always a good idea to be prepared. A quick and efficient response to an attack on your network can save an untold amount of time, money and staff hours. Even more, in today’s risk environment you need to know what tools to have in place to flag potential indicators of a compromise, have a response team on the ready and have a digital evidence trail for legal protection. • What is the likelihood of getting breached? • If you’ve been breached, what is the first thing you should do? • Is your security growing with your business? • Do you have a viable plan to handle the 3 biggest security challenges facing growing businesses? • Where should you begin? In this interactive session, find out what your peers are most concerned with, how they prioritize, and what works best for reducing risk. We will feature a couple of real world examples of breach incidents, discuss how the breaches occurred and simple steps you can take to prevent your business from becoming the next victim. As breaches of the network perimeter become more common, organisations that safeguard data where it lives - in the database - will prevail. Data stores are an enticing target for cybercriminals. This is only amplified by the common misconception many organisations have that their database assets - whether they are on premise, in a datacenter or in the cloud - are secure. So, where do you start? What can you do right now to secure your databases with authority and finesse? BONUS: Attendees may be eligible for a 6-month database security assessment tool license at no cost. Trustwave helps businesses fight cybercrime, protect data and reduce security risk. With cloud and managed security services, integrated technologies and a team of security experts, ethical hackers and researchers, Trustwave enables businesses to transform the way they manage their information security and compliance programs. More than 2.7 million businesses are enrolled in the Trustwave TrustKeeper® cloud platform, through which Trustwave delivers automated, efficient and cost-effective data protection, risk management and threat intelligence. Trustwave is a privately held company, headquartered in Chicago, with customers in 96 countries. 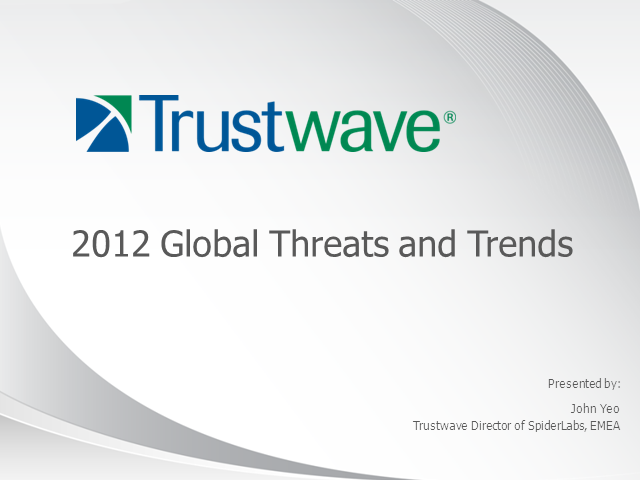 For more information about Trustwave, visit www.trustwave.com.